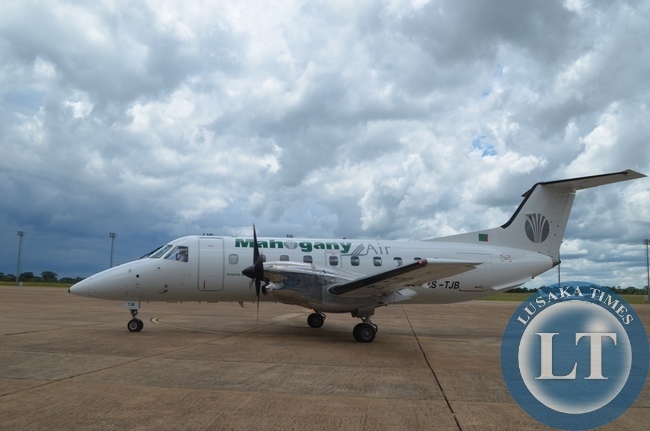 Minister of Tourism and Arts Charles Banda is today expected to sample the first ever Mahogany Air flight into Mansa, Luapula Province. The Minister said the coming of Mahogany Air on the scene will create the necessary competition and break monopolies in the industry. Speaking when the airline’s Chief Executive Officer, Dr. Jim Belemu paid a courtesy call on him at his office today, the Mr. Banda said the airline would now make air travel affordable. Mr. Banda said his ministry has been fighting the existence of monopolies in the industry ranging from accommodation, operators in national parks and game management areas. The Minister said many people would love to travel by air affordably than enduring long distances traveling by road mode of transport to visit tourist attractions. And Mahogany Air flight Chief Executive Officer, Jim Belemu disclosed that a lot of people from Europe have appreciated and are buying tickets following the establishment of the Zambia Tourism Expo. Dr. Belemu noted that the best tourism is local tourism as it creates new market for travelers hence the reason why his airliner opened up new routes putting Mansa destination on its agenda. He said his airline has keenly followed a lot of tourism programs about Luapula and hence operating on the Mansa route. Dr. Belemu assured government that the doors of the airliner would always remain open to all. This is contained in a press statement issued to the media in Lusaka ysterday by Ministry of Tourism and Arts Public Relations Officer, Sakabilo Kalembwe. Zambia Airways flights is when?? Towards the end of this year, Enka. That is if Trump pulling out of Iran Nuclear deal does not lead to serious economic somersault for your Zambia. How old is this little plane?